Gartner’s Hype Cycle (official definition) is a research graphic that is far more useful than the Magic Quadrant, even if it is not as visible as the MQ. While it is not obsessed over like the MQ, Gartner has built a franchise around the Hype Cycle with the annual July spate of around 90 Hype Cycle research notes. These cover an average of 1,300 technologies and the related graphics are used in many conference presentations. While the Hype Cycle provides valuable insights into how technology is adopted, Gartner has not provided much insight into the Hype Cycle itself. This is not all that unusual for IT industry analysts firms that are focused on cranking out topical research papers rather than teaching their clients and the marketplace about how to use the research. There is the “Understanding Gartner’s Hype Cycles” research note that accompanies the annual Hype Cycle series of research notes. However, there is only so much understanding that can be crammed into 12 to 14 pages. That is why this new book on the Hype Cycle has the potential to very useful. Mastering the Hype Cycle: How to Choose the Right Innovation at the Right Time (Harvard Business Press, $19.77 + S&H on Amazon) is by Hype Cycle creator Jackie Fenn and colleague Mark Raskino. The book has two goals. First is to ensure that the reader is completely conversant about what the Hype Cycle is and is not. The second is provide insights into how the Hype Cycle can be used by innovation champions inside corporations to make sure that innovations are brought in at the right time. “Part 1: The Hype Cycle” does a thorough job of explaining the Hype Cycle with lots of stories to illustrate points. Even somebody as familiar with the Hype Cycle as myself found aspects that I had not known or had forgotten. Some might say that stories from the early 1990’s might be out of date, but the reality is that some lessons about adopting innovations take years to emerge. Because the book has the ability to add real-world stories and expand explanations, I think that some of the more interesting aspects of the Hype Cycle really come through. However, I would have liked more extensive examinations of actual Hype Cycles to trace the trajectory of selected technologies, services, or management techniques over several years. While this is difficult to do because of the ephemeral nature of Gartner research, this sort of examination would yield valuable insights into how actual “dots” progress along the curve and why things went as predicted or took unexpected twists. “Part 2: The STREET Process” discusses the process to apply the Hype Cycle to identify, vet, and potentially adopt innovations. STREET stands for Scope, Track, Rank, Evaluate, Evangelize, and Transfer. STREET is not all that different from a number of frameworks for evaluating innovations – many of which Fenn and Raskino cite. This section’s strength is how to apply the Hype Cycle to technology innovations. For individuals and organizations that are not well versed in innovation evaluation Part 2 will be as valuable as Part 1. However, individuals who read a lot about innovation adoption processes will be able to skim this section, concentrating on Hype Cycle specific issues. For the vendor community it will be necessary to “read between the lines” to really pull value from the book. In part two of this review, I will specifically focus on the analyst relations (AR) role to illustrate how a vendor can harvest valuable insights from the book. While the book has lots of valuable insights, it is important that Gartner clients leverage their contracts in order to talk directly to analysts about the Hype Cycle concept or particular Hype Cycles. As with most Gartner research, the Hype Cycle is best understood when you probe the analysts’ assumptions, research methodology, and decision process. There are two distinct groups of analysts to talk to: Fenn and Raskino in order to better apply the concepts, and the analyst-authors of specific Hype Cycles in order to better understand how the Hype Cycle was applied to a market. 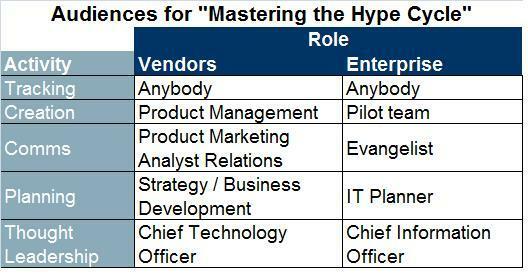 Bottom Line: Enterprise and vendors alike can derive value from reading and applying the Hype Cycle concept. However, it does take work to burrow into the STREET framework, something that is worth the investment of time. Question: How have you used the Hype Cycle in your work? Thanks for the review, Carter, and I’m glad you found the book valuable. Your readers may be interested to know that Peter Sondergaard, head of Gartner research, will talk briefly about the book at the AR Forum at Symposium/ITxpo in Orlando. I think attendees will also get a copy of the book. I took a shot at teasing out some of the implications for vendors in this book. My basic point is that vendors can succeed by consciously positioning themselves and timing their marketing efforts with the Hype Cycle in mind. I’d love to hear your take.